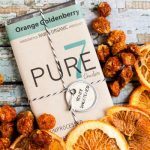 So, the last food blogging post was about joining pinterest group boards and why you definitely should join them. 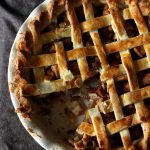 Now, I don’t know about you, but after I’d joined about 10 pinterest group boards, I suddenly realized that I was in way over my head. I didn’t have enough time in the day to keep all those boards organized, keep track of the rules for each board, and make the most of these boards. I tried multiple pin schedulers, but ultimately BoardBooster was the best one I found and the easiest to just set and forget. I can now schedule hundreds of pins at once–a whole month in advance if I want to, and BoardBooster just does it all for me. It’s really awesome to go on Pinterest at the end of a day and see that I just got 200 repins in the past few hours. BoardBooster has been busy, and I’ve done absolutely nothing. Okay, while not absolutely nothing. I’ve done other useful stuff in my day, of course. You know. Like reading a desperately important cheesy romance novel. Or watching an episode of The Great Food Truck Race (spoilers, guys: the Korilla truck people cheat). But anyway. Boardbooster is really cool. 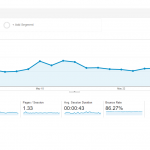 My free trial expired last month and I slammed down the money immediately ($5 a month. For a cheapskate, that is really brutal). So far I don’t have any buyer’s remorse. If I do I can just cancel, five or ten dollars poorer. But I don’t think that’ll happen. 1. Link your Boardbooster account with your pinterest account. 2. Tell BoardBooster which boards you’d like it to pin to automatically. 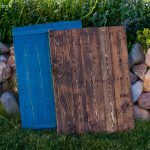 Boardbooster will create secret boards with the same names as the pinterest group boards you’d like to pin to. 3. 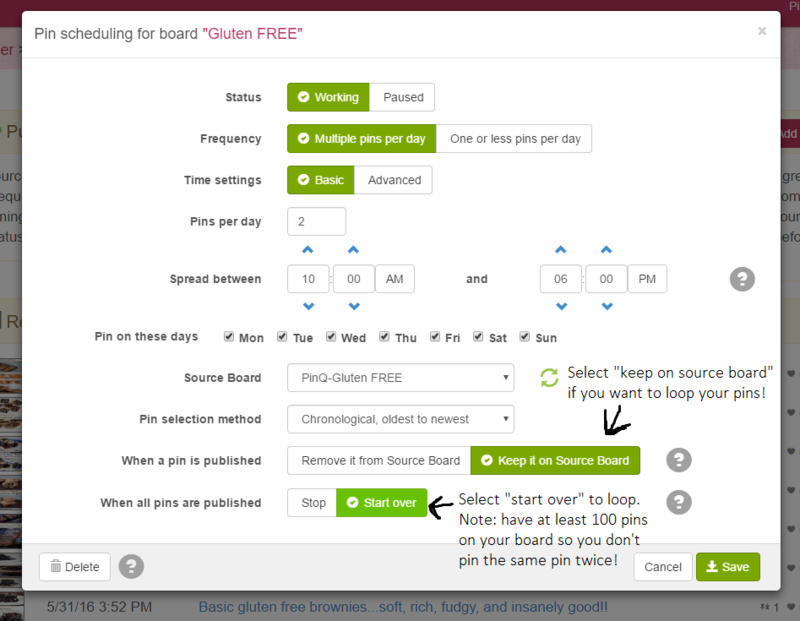 Select how often you’d like Boardbooster to pin to each board and configure other settings. Make sure when you set this up that you are abiding by the rules of the group board! 4. Pin a whole pile of pins to each secret board. 5. And watch the magic happen as Boardbooster takes the pins from your secret boards and puts them onto the actual pinterest group boards. 1. Rename the secret boards that Boardbooster creates for you. 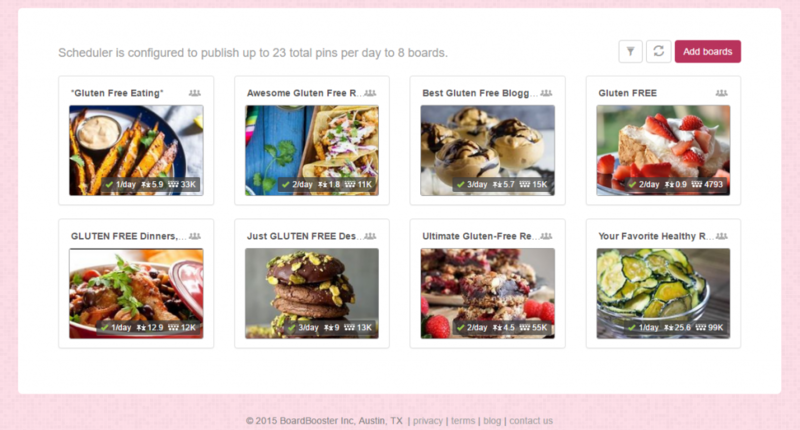 For example, say you want to pin to your “Gluten Free Recipes” board, and Boardbooster creates a secret board, *Gluten Free Recipes. * Unfortunately, the names aren’t different enough. I actually found myself pinning directly to the real board rather than the secret board. So I just renamed each of my secret boards, putting “PinQ” (short for Pin Queue) at the beginning of each title. When I’m pinning to the boards, it’s much easier to tell the real board vs the secret board apart. 2. Don’t have BoardBooster delete pins form a secret board after it’s been pinned to the group board (personal preference). When you’re configuring the board on BoardBooster, you can choose whether Boardbooster deletes the pin after pinning or keeps it. I prefer to keep it and run my pins in a loop…so I have about 100 pins on each secret board. BoardBooster keeps the pins on there, and once a month or so it repins the same pin over again, running on a continuous loop and making things easier for me. 3. Track your results! This is important, since you’re paying for every single pin Boardbooster shares. You want to keep track of which boards give you the most results so that you can pin more to them and less to the boards that don’t convert well. So each week just go through all your boards and check out which ones are getting the most repins. Boardbooster keeps track of this for you, so just look at things like board performance. If a board isn’t performing well, I just change my settings so that it’s not getting pinned to as much. 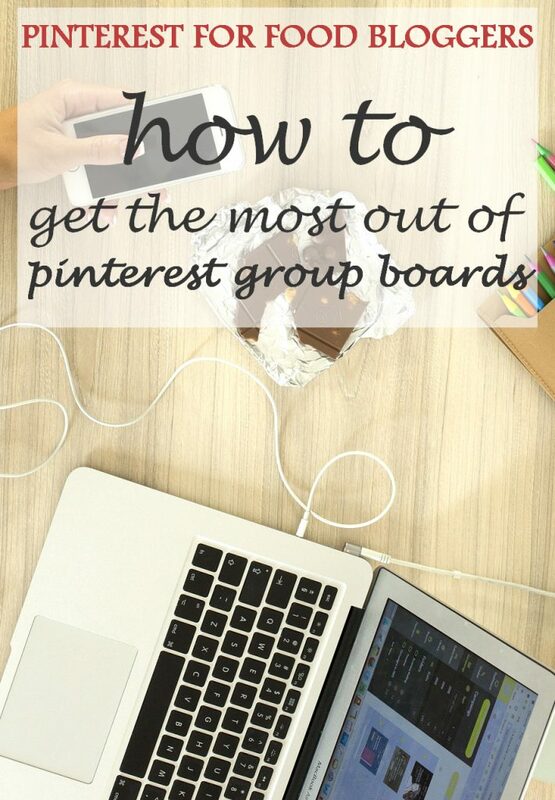 Also go and look at the pinterest group boards themselves to make sure that you’re not flooding them with your pins. If there’s a board you seem to be flooding a bit, then cut back. 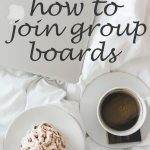 Between joining some group boards and using Boardbooster to streamline my pinning, I’ve seen my repins, follows, and likes skyrocket. 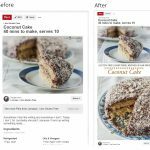 Pinterest is one of the best social media platforms for bloggers to use, and I’ve realized that I wasn’t taking full advantage of the growth that Pinterest could offer me. 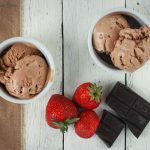 There is one more big change I had to make to really get the most out of Pinterest group boards: optimizing my pins and blog. And that, my friend, is the subject of part three of this three part Pinterest series. 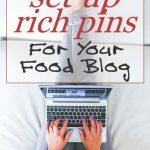 Click here to read part three on Pinterest for Food Bloggers! Full disclosure: The link above to BoardBooster is an affiliate link, but I would 100% recommend this product whether I was getting paid or not.